Our faces are constantly transforming and ageing everyday, but often the impact of the passing years are often too subtle to notice. 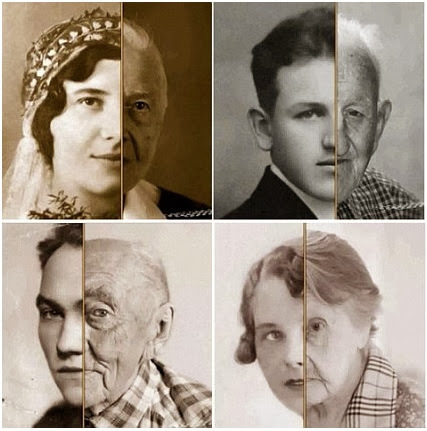 To illustrate the profound changes over a lifetime, a photographer took portraits of ten people all aged over 100 to compare against what they looked like in their younger years. They were then transformed into fascinating gifs showing in the blink of an eye the transformation a face undergoes in a lifetime. Smooth, plump skin is replaced with worn and creased lines, while thick and vibrant hair becomes thinner and greying. With eyesight failing some of the subjects now wear glasses, although many retain a similar smile to their younger years, their faces wrinkled with laughter lines. But many viewers who have studied the photographs have commented that in all photos, the subjects' ears and nose are seem to have grown bigger. This allows the toes to spread out and the arch of the foot to flatten. Some over-40s can gain as much as one shoe size every ten years. Some of the subjects have softer features around their mouth and jaw areas - just as skin loses elasticity and plumpness, the tissue in our gums lose bulk and volume. This causes gums to shrink back - gum recession can increase the length of the teeth by up to a quarter of an inch, a phenomenon known as tombstone teeth. Our gums start to deteriorate from the age of 40, exposing the dentine that makes up the root of the tooth. Many of the younger years photos show the subjects in formal wear as their portrait would have be needed for a passport or a work permit - between them they had jobs as carpenters, musicians, bankers, soldiers and housewives.